To jumpstart IWY 2015-2016, the Inner Wheel Clubs of the Philippines, Inc. (IWCPI) had its National Leadership and Training and Seminar last May 29-30,2015 at the Eugenio Lopez Center in Antipolo, Rizal for the incoming District and Club Officers. The two-days training schedule was jam packed as it includes all vital information that a District or Club officer must know. All the delegates were welcomed by NLTS Honorary Chairman IWY 2014-2015 National President Bebe Relucio. IWY 2015-2016 National President Cecille Ferrer discussed the organization’s thrust, focusing on this year’s theme “Unique and United”. Other resource speakers were: National Vice President Gloria “Baby” Golez on Schedules of National Events and members obligations; National Representative Gloria “Glo” Ramat on Updates on Rules on National Directed Projects Subsidies; National Secretary Ruby Panso on the topic Conducting Inner Wheel Meetings; Incoming Deputy National Representative Amelia “Bibie” Jarin on Rules of Conduct and Ethics; Incoming National Representative Margarita “Margie” Ortiz Luis on IIW Requirements in Forming a Club; Past IIW Board Director Linda Jardeleza on IWCPI Articles of Incorporation and ByLaws and the IIW Constitution Amendments Procedure; and Past National President Cecille Ramos discussed the Duties of National, District and Club Officers, and Duties of Project / Event’s Chairman. 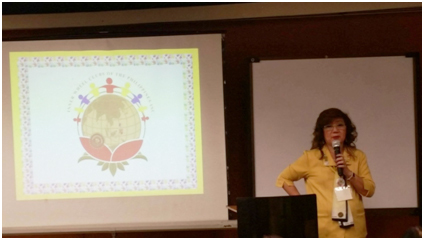 Past National President Concepcion “Nonie” Basilio gave a talk on “Uniqueness of Inner Wheel As An Organization”, where she shared her experiences on being a member of Inner Wheel and what makes our organization different from other organization, to quote: “It (Inner Wheel) is the only organization in the whole world that subscribes to the ideals of friendship, service and international understanding, in that order. Therein lie the uniqueness and charm of Inner Wheel as an organization. That being so, let us remember that Inner Wheel is first and foremost, a friendship club and a service club only second, and most importantly, that friendship is the fountain head of selflessness, goodwill, and cooperation. With friendship as the motivating force, even the most rigorous and daunting tasks become an enjoyable experience.” This was followed by a talk by Fr. Larry Faraon on “Achieving Unity in Diversity”. 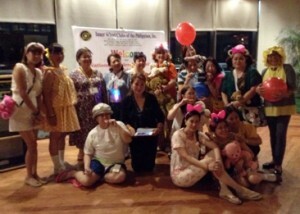 The first day training was capped with a Children’s Party Themed Fellowship Night where each member enjoyed and went back to their childhood days. 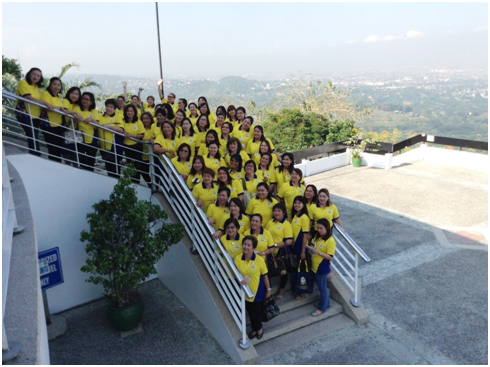 All were shining on their Yellow Inner Wheel shirts on the second day of training. The day started with group picture taking at the scenic view of Antipolo. Resource speakers for the day were: IWY 2015-2016 National President Cecille Ferrer on Writing Reports and Incoming IWCPFI President Teresita “Tess” Cruz on the Role of IWCPFI in IWCPI. All members grouped by District for the Harmonization of District and Club Goals and Plans, facilitated by NLT Chair National Vice President Edna Ibrado and NLT Co-Chair Past District Chairman Amalia “Inday” Santos. After which, all Districts presented their respective plans to the body. The seminar ended with the distribution of certificates of attendance to all delegates, and certificates of appreciation to all the members of NLT Committee.